Today in this comparison article, we will be comparing Tramontina vs Lodge Dutch Oven brands of cookware. These Dutch ovens are well known for their quality and versatility. On top of that, you really can’t go wrong with either brand and will surely love your Dutch oven. With that said, there are some key differences between these two brands and we’re here to share them with you. More specific, we will be comparing the Tramontina Enameled Cast Iron 6.5 Qt Dutch Oven vs the Lodge EC6D43 Enameled Cast Iron 6-Quart Dutch Oven. So, let’s begin, shall we? First, we will take a look at the Tramontina Enameled Cast Iron 6.5 Qt Dutch Oven. This includes factors to look for in this product as well as Lodge color enamel 6-quart Dutch oven types. Next, we’ll share each product’s pros and cons as well as some actual customer reviews. Finally, we will share our final verdict and our opinion on which Dutch oven is the best choice. So, let’s begin with the key factors to look for in each of these products, starting with the Tramontina brand. Thanks to its heavy-gauge cast-iron core, the Tramontina Enameled Dutch Oven has a durable body. This, in turn, is coated with a PFOA- and PTFE-free porcelain enamel shell. And speaking of durable, the stainless-steel knob is solid cast and oven-safe. How Versatile Is The Tramontina Dutch Oven? The Tramontina Dutch oven is an incredibly versatile and easy-to-use piece of cookware. For example, it will keep food both hot and cold thanks to cast-iron’s superior temperature retention properties. The self-basting condensation ridges on the lid will collect and direct moisture back into the food for added flavor. This will also prevent your meals from becoming dry and tasteless preventing waste. On top of that, it is great at simmering, baking, frying, searing and sauteing. What’s more is the fact that this Dutch oven is compatible with ceramic, electric, gas and induction cooktops. In conclusion, you can tenderize meats, bake poultry and desserts, and steam vegetables. How Heat Resistant Is This Tramontina Dutch Oven? You really can’t speak about versatility without mentioning the Tramontina Dutch oven’s heat resistant and temperature retention properties. This handy piece of cookware is oven-Safe up to 450 Fahrenheit or 232 Celsius. How Easy Is The Tramontina Dutch Oven To Clean? Continuing the ease-of-use qualities of this Dutch oven, clean-up is always a breeze and hassle-free. First of all, while this product must be hand-washed, its nonstick porcelain coating ensures food slides right out. Therefore, you’ll spend more time creating amazing meals and less time cleaning dishes. How Easy Is The Tramontina Dutch Oven To Maintain? As with clean-up, maintaining your Tramontina Enameled Dutch oven couldn’t be easier. First, scrape any large food particles off before soaking in hot soapy water. Second, wash with a dish sponge or scrubber. Then rinse and let air dry until all moisture has evaporated. Finally, this Dutch oven is coated in porcelain, so there is no need to season the cooking surface with oil. It’s that easy. With the good also comes the not so good. And this product is no exception. Furthermore, there are some issues that do need to be addressed. First of all, some customers reported that the porcelain coating chipped after only a few days. Second, there were a few reports of food burning and sticking to the bottom of the pan. These issues, while not anywhere near the majority of complaints, are still important to note nonetheless. With that said, we strongly feel that the Tramontina Enameled Dutch Oven is a strong choice for the top Dutch oven. Affordability And Where To Purchase? One of the best features of the Tramontina Enameled Dutch Oven is the affordable price. And currently, you can pick up this top-rated product at Amazon.com for under $60. So, if you feel that the Tramontina Enameled Dutch Oven is right for you, check it out today. The Tramontina Enameled Cast Iron 6.5 Qt Dutch Oven is a definite top contender for the best enameled Dutch oven. This also means that any Lodge enamel dutch oven it goes up against has to really prove itself. With that said, the Tramontina Enameled Cast Iron 6.5 Qt Dutch Oven has many amazing qualities. It’s durable, versatile and extremely easy to clean and maintain. And while there are some issues, we believe that this product is overall, a high-quality piece of cookware. Our last but certainly not least product is the Lodge EC6D43 Enameled Cast Iron 6-Quart Dutch Oven. This Dutch oven is another top-selling, highly-rated piece of cookware that we’ll be comparing today. Just like the Tramontina Dutch Oven above, this Lodge Dutch oven is a giant among Lodge Dutch ovens in general. So, let’s begin with some factors to look for in the Lodge EC6D43 Enameled Cast Iron 6-Quart Dutch Oven. How Good Is The Construction Quality? The Lodge 6-quart enameled cast iron Dutch oven is constructed of a solid cast-iron body. Furthermore, the cast-iron core is coated in a chip-resistant porcelain-enamel finish which is designed to last. Finally, it measures 10-3/4 inches in diameter by 4-1/2 inches deep. Which will make cooking even the largest of meals a snap. This all combines to make a sturdy and resilient Dutch oven that can run with the best of them. How Versatile Is The Lodge Dutch Oven? One thing that Lodge EC6D43 Enameled Dutch Oven is not, is a slouch in the versatility department. On the contrary, this Dutch oven offers a large variety of safety and just all around practical features. The first versatile feature is the cast-iron looped side handles. This handy little feature will allow for a secure, and safe grip when moving around the kitchen. Furthermore, the smooth porcelain cooking surface will not react to acidic food ingredients. Finally, you can use this Dutch oven with ceramic, induction, electric, and gas stovetops. This opens up more possibilities for where you’ll be able to prepare your meals. With that said, you should not use this product in campfires, on outdoor grills, or microwaves. How Heat-Resistant Is This Lodge Dutch Oven? With the Lodge Enameled Dutch Oven you can easily sear, bake, roast, braise, and broil all your favorite foods. Furthermore, the stainless-steel knob, as well as the Dutch oven, is oven safe up to 500 degrees Fahrenheit. How Easy Is The Lodge Dutch Oven to clean? The is incredibly easy to clean. First, allow the cookware to cool before washing. Second, hand-wash in warm soapy water with nylon pads or plastic scrapers. This is to prevent scratching, as metal utensils should never be used. Then, rinse and air-dry making sure that there is no excess moisture present before storing. Finally, while this Dutch oven is dishwasher safe, it is highly recommended to hand wash. This is because machine washing may cause the enamel coating to fade in color. How Easy Is The Lodge Dutch Oven To Maintain? Maintainance is also a breeze with the Lodge EC6D43 Enameled Dutch Oven. First of all, to remove minor stains, simply rub the Dutch oven with a dampened cloth and some baking soda. However, for removing persistent stains do the following. Simply soak the interior of the Dutch oven for 2 to 3 hours with a mixture of 3 tablespoons of household bleach for every 1 quart of water. Next, to remove stuck-on food, bring 2 cups of water to a boil with 4 tablespoons of baking soda. Then let soak for overnight. Finally, tighten the knob screw before preparing every meal, making sure to be careful not to crack the lid. Though this Dutch oven is a top-quality product, there are some issues that need to be addressed. There were some reports of the Lodge Enameled Dutch Oven’s enamel chipping and cracking from customers. Furthermore, there were also reports of damage from transit resulting in cracking and chipping as well. Affordability And Where To Buy? 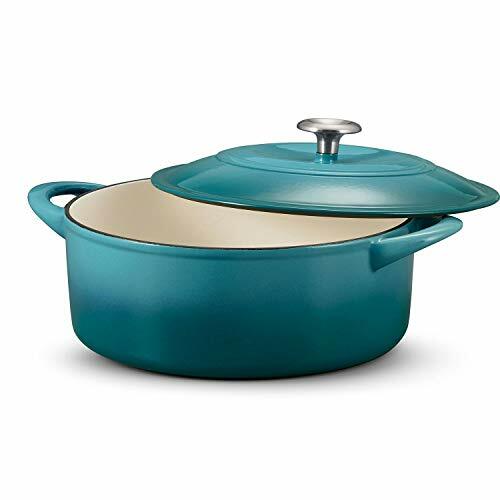 As far as price goes, the Lodge Enameled Dutch Oven shares the same affordability as the Tramontina Enameled Dutch Oven. With that said, you can find the Lodge EC6D43 Enameled Dutch Oven for under $60 at Amazon.com. So which one to choose, that is the question, correct? Well, after carefully considering the merits of each Dutch oven, our decision was based on one simple fact. This decision was tough, however, we chose the Lodge EC6D43 Enameled Cast Iron 6-Quart Dutch Oven in the end. And why did we choose the Lodge Dutch oven? Well, it all came down to heat resistance. Furthermore, the Lodge Dutch oven can withstand oven temperatures up to 500 degrees Fahrenheit. This is contrasted by the Tramontina Enameled Dutch Oven which can withstand temperatures of up to 450 degrees. So, with a slight edge, the Lodge enameled Dutch oven barely wins this head to head battle. If you are wondering what size dutch oven should I buy, fear not, both of these products are close in size. For instance, the Lodge Dutch oven is 6-quarts, while the Tramontina Dutch oven is 6.5-quarts. So, even with the half of a quart advantage, the Tramontina Dutch oven still gets edged out. This is because, for us, the 50-degree max oven temperature advantage trumps Tramontina’s half quart capacity advantage. In conclusion, you really can’t go wrong with either one of these high-quality Dutch ovens. With that said, if you would like to check out our other Dutch oven reviews, feel free to click on one below. For our full review of the Tramontina Enameled Cast Iron 6.5 Qt Dutch Oven, you can click here. You can also read our full review of the Lodge EC6D43 Enameled 6-quart Dutch Oven. In conclusion, we would like to thank you for viewing our comparison article. And we hope you found what you were looking for. We also hope to see you again soon, and please take care.